To start with, let me just say that the design and development of TW:WH had often been about finding a balance between wanting to be both faithful to the WH lore, and true to tried and tested TW concepts as much as is possible. In the vast majority of design decisions, these two principles fit like a glove and everything moves along happily. In some cases, however, there is a clear tension between them, but which also offers interesting new gameplay possibilities. The region occupation system is one such example of this. Al is just over 300 turns into his Vampire Counts campaign now. Recently a massive Chaos Warrior invasion force has been driven back to the Chaos Wastes, and he’s positioned his strongest armies under Mannfred von Carstein to hold them back at the pass in Eastern Oblast. However, his agents report new forces massing in the Wastes, so time is of the essence. The Empire is wiped out (achieving one of the Vamps’ ‘Short Campaign’ victory conditions), the burning wasteland left by the Chaos Warriors in the centre of the map is ripe for expanding his territory, if he can beat the Bretonnians and Border Princes to it under the noses of the Norscans. His raiding of the Holds in the mountains to the south (whether held by Greenskins or Dwarfs) is high risk, but has proved effective in providing income to aid the war effort elsewhere. A successful raid further into the peaks could provide a huge resource boost that would bolster Mannfred in the North, but would take a specialist army and some disruptive counter-agent tactics to keep the worst of the Greenskin tribes disorganised in their response. Currently the Border Princes are sending increasingly grovelling entreaties for trade partnerships. Too keen by half they likely have some unseen pressure at their backs. Discovering what’s going on through agents, or sending a force to push through the mountains and take their lands from them would open up the bottom half of the map, or are they a helpful ‘stopper in the bottle’ for now that could keep whatever it is at bay? Annoyingly, Bretonnia has recently been left unchecked, and has thrived at the defeat of the Empire. There was a point when Al’s Vampires held a number of their territories, but had to pull back under pressure from Norscan raids. A wholesale push in that direction could provide a new homeland if the Brets can be roundly defeated. This could make for a better defensive position against resurgent Chaos Warrior hordes. So, as you can appreciate, significant parts of the world are occupiable by any given race in the first game, then there are those parts of the world which you will need to deal with in a different way from ‘traditional conquering’. Simply painting the map your colour is not always a route to victory, and is arguably the least strategically interesting. Let me also say that such a divide is not necessarily going to occur in future instalments of the trilogy. It needs to make sense for the game in each case, as I’ll go on to talk about. IS THE ABILITY TO CAPTURE EVERY REGION ON THE MAP ‘SACROSANCT’ TW GAMEPLAY? Every previous TW game contains humans vs humans. In real world history, cities from one culture have been occupied by another culture and the populace controlled via one means or another. This is true in any given situation and with any combination of cultural differences. Ultimately, in the real world, we’re are all still human and have more similarities than fundamental differences. We can all co-exist one way or another. As a result, every previous TW game has allowed all regions to be occupied by any culture because it still fits within the bounds of our historical authenticity remit and the whole thing makes sense. Understandably, TW fans who have played many titles may instinctively see this as ‘sacrosanct’ TW gameplay. However, when you think of the many TW campaigns you’ve played over the years, what percentage of these campaigns have you truly completed to this degree? I changed careers 15 years ago, and joined CA, because I fell in love with Shogun: Total War. I’ve lovingly spent thousands of hours playing every single TW title since then as a genuinely passionate TW fan. Even so, I can honestly say I have rarely finished a campaign to the point where I owned every region on the map. The Victory Conditions – and indeed the very essence of the game – are always over way before that point is reached. By the time you get to the point where you’re capable of taking every region on the map, it tends to become an auto-resolving slog just for the sake of completeness and to ‘tick a box’. There is no gameplay left at this point. We wanted to address that with more interesting gameplay in the mid and end game. Now I get that the principle of being ‘able’ to do that in a sandbox environment resonates strongly within all of us. The design team and I grappled with this issue early on. The conclusion we came to is that this particular principle is a theoretical concern more than an actual one. 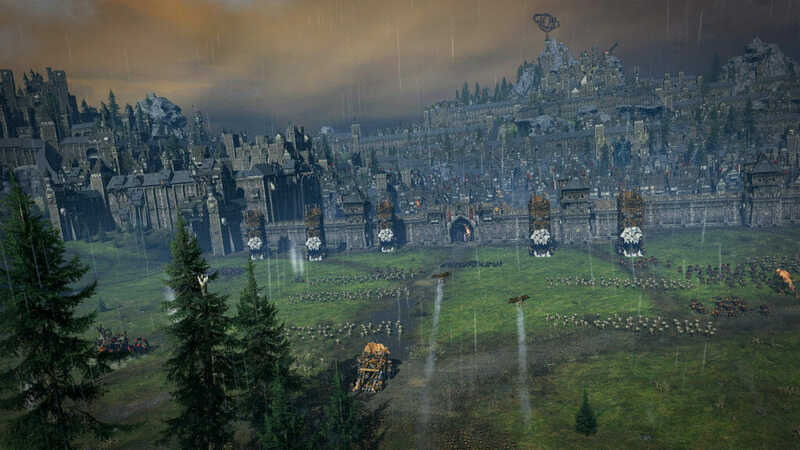 In fact, as the TW: Warhammer campaign has become more playable heading towards Beta, nearly all of the initial internal concerns about it have been resolved. Testers that were initially perturbed about the idea have, upon seeing and playing the actual implementation, changed their minds, now seeing the design as a benefit to the game and not the detriment they initially feared. Plus, so much of what shapes your campaign and informs your choices is driven by your race’s specific victory objectives; so much so that the notion of complete territorial ownership is kind of moot. You don’t have to read through the lore of the Greenskins and the Dwarfs for long before you see how integrally linked these two races are. Skaven feature heavily as well, but we’ll have to put them aside for the moment because they’re not in the first game. The Dwarfs once populated the whole of the World’s Edge Mountains and the Grey Mountains with their vast empire. Since those great days, the Dwarfen Holds have gradually been captured and occupied by Greenskins. Greenskins have their somewhat crude villages in the Badlands as well, but much of the lore for both these races lies entwined with the fight over these Holds. 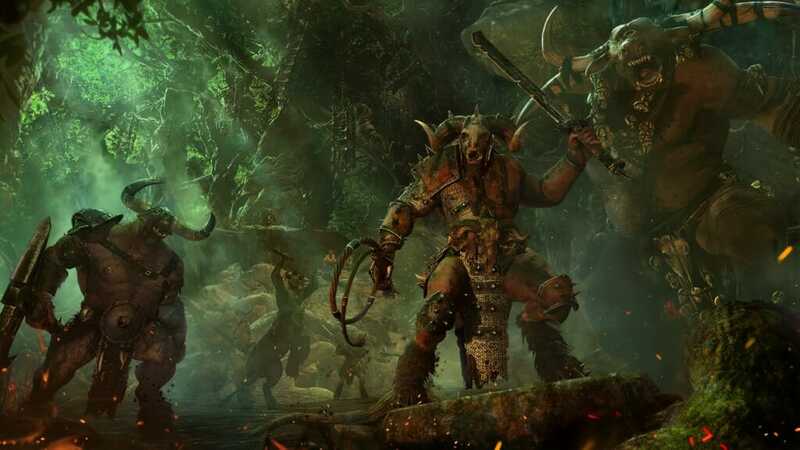 Sure, deep within the lore lie references to occasions where Greenskins have occupied other types of regions, but essentially, as far as Warhammer canon is concerned, the focus of Greenskins and Dwarf settlements firmly lies within the Holds. With the exception of Skaven, no other race has ever occupied a Dwarfen Karak . Nor would it make sense for them to (yes, I know Neferata invaded the Dwarf city of Silver Pinnacle in -326 but this was a very rare exception to the usual paradigm. I’m sure a few other examples can be found in older novels, but in general it’s the Greenskins and Dwarfs that fight over the Holds). Similarly, the Empire have never sent an army to Karak Kadrin, besieged it and then occupied it. It just doesn’t make sense for a population of humans to occupy a massive fortress deep under the ground. It would just feel wrong. The lore is, however, full of instances where one race or another besieges and smashes a city to bits – or even razes it to the ground. This is what happens when a massive Greenskin Waaagh! plunges deep into Empire territory. The Greenskins don’t occupy Altdorf and immediately start managing and taxing the local human populace. It just doesn’t feel right or true to the lore in any way. Races choosing to inhabit only specific kinds of habitat reinforces the authentic feel of the WH races. Whichever race you choose to play as has a genuinely different feel and mix of choices to make. If you play as Greenskins, you will contest ownership of the Holds within the mountains and the Badlands whilst raiding the human settlements to bolster your coffers and level up your Heroes. The difference in choice of occupiable settlements goes a long way to ensuring that playing as any given race provides a unique and interesting set of strategic challenges and gameplay. If everyone could capture everything, this wouldn’t be the case. For completeness’ sake, let’s quickly touch on the Norscan factions. Norscan settlements are fishing villages and raiding outposts on the border of the deeply inhospitable Chaos Wastes. Attrition rates are high and the influence of Chaos is rife. 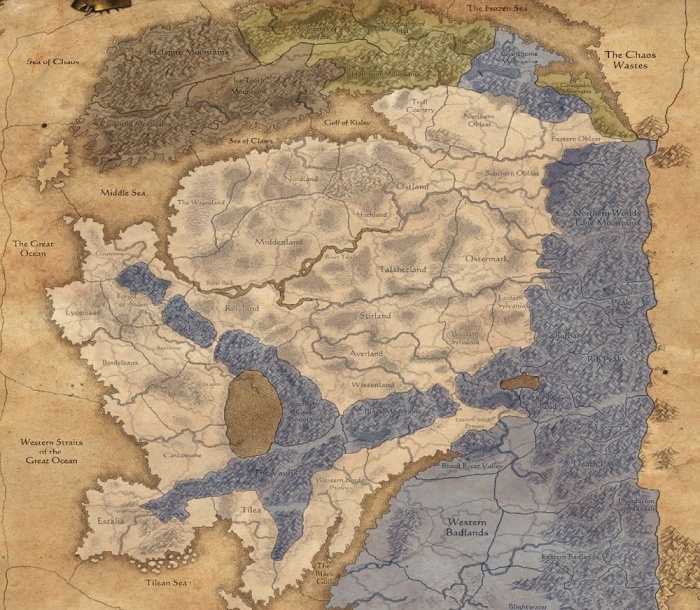 In the Warhammer lore, the other races don’t occupy these lands (with the exception of Kraka Drak, the Dwarf clan who settled there centuries before). But by and large these lands are untenable to all but the Norscan tribes who feed Chaos with their converts. To allow occupation of these settlements would, again, feel wrong and contrary to a meaningful sense of how the Old World works. Likewise, Norscan tribes don’t occupy other settlements and manage the populace. They raid and pillage and return to their Chaos-ridden hovels. They will make deadly incursions into the Empire and Bretonnia, leaving ruin and desolation behind them, just as they do in the lore. So essentially, we have endeavoured to create an authentic Warhammer world where the flavour and interactions of each of the very distinct and unique races is accurately portrayed. Players will exist and fight and do all the usual TW things within this unique world. 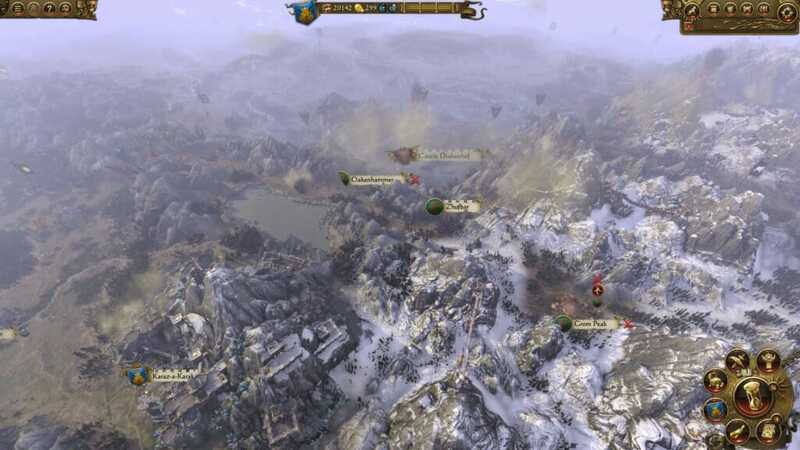 Yes, there will be a natural restriction to which settlements can be occupied by certain races but this is partly in order to fulfil a much more satisfying and important goal – to reproduce the Warhammer world with TW gameplay. Having said all this, if there weren’t also the gameplay advantages that I’ll talk about next, the lore considerations wouldn’t have been enough for us to make this decision. If we felt that this particular principle of sandbox gameplay was as important in reality as it sounds like it might be in theory, we would still not have made this decision. Gameplay ultimately rules the roost. This is by far the most important factor in the choices we’ve made regarding Regional Occupation. First, I want to quickly talk about the pretty standard TW campaign formula… Although some of our games encourage players to have outpost settlements in various areas of the map that are distant from the main faction’s start position, essentially, every faction in every TW game to date broadly follows a similar theme. Whether turtling or expanding (or somewhere in between) the overriding common-sense approach to progressing through a campaign game is to occupy regions next to your starting ones and then systematically expand out from that point. The bubble then gradually grows outwards from those starting regions. This is still very much the case with TW: Warhammer but, more often than in previous TW games, players are confronted with some regions that they cannot occupy. Instead we want players to think differently about certain regions. Do they raze the settlement to the ground with no gain other than the knowledge that this is the most efficient way of curtailing the threat from this area? Will a player sack the settlement, gain an immediate cash boost and diminish the short term productivity and threat of the settlement but have to deal with it again in the medium to long term? Will they choose instead to not over-stretch themselves and instead fortify their defences, creating deadzones and buffers in preparation for a likely invasion? These kinds of factors don’t just bolster the feel of each of the races in the WH lore but they create an interesting set of gameplay choices. It’s still very much TW but with a difference that keeps the gameplay fresh and new throughout the course of your campaign. And never underestimate the usefulness of forging peace with an ally whose territory you can’t occupy, then using them as a buffer when Very Bad Things are coming towards you… and take it from me, they will. I start with Karl Franz occupying Altdorf and am surrounded on all sides by other regions owned by the various Elector Counts from the Empire Provinces. To my West across the Grey Mountains lies Bretonnia. Scattered throughout the narrow passes through the Grey Mountains, however, are Dwarfen Holds – some occupied by Dwarfs and some by Greenskins. To the East lies Sylvania and the Vampire Counts. When it comes to the Holds in the mountains however, razing or sacking are my only options. As a player you cannot simply increase the borders of your Empire ever outward, relentlessly choosing to occupy and manage (as is generally the most likely choice as part of completing a TW campaign). So now you need to decide whether to neutralise the threat via gaining alliances, conquering, or seeking to profit from it via sacking. 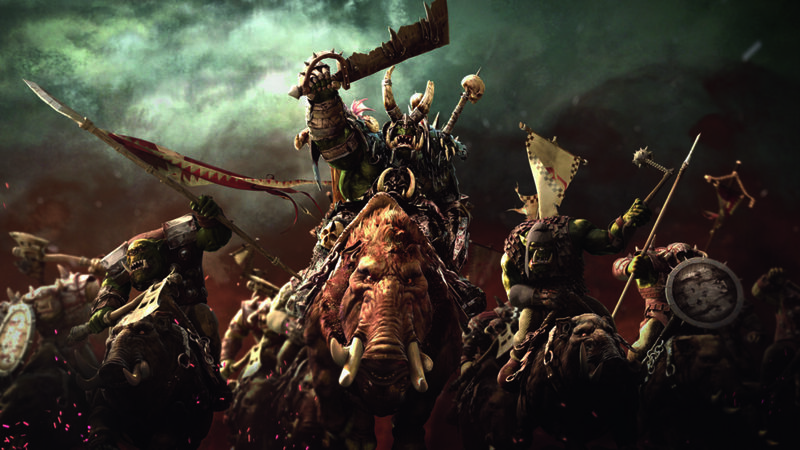 The Dwarfs will be easier to ally with but it is possible (however difficult) to broker a cease-fire with a local Greenskin occupied Hold in extreme circumstances (such as the all-consuming threat of an even bigger, spikier common enemy for example). By switching up the constant forward steamroller that characterises many TW mid-games, and giving the player a lot more varied strategic decisions to make throughout the game as they juggle the various pressures without and within their borders, there are plenty of new challenges and decisions for you to make. Later on in the game, you will still be able to occupy and manage a great many regions, regardless of who you play as. Also, with the additional of the new global recruitment feature, armies from all races can now operate deep behind enemy lines if they choose. The Badlands and the World’s Edge mountains can become cash-cows where your armies raid and sack for income. Alternatively, you can choose to raze these areas to the ground and minimise any future threat. There are still a great many gameplay options around these areas. The cash generated here may well be crucial if you are to afford high-end buildings like the Colleges of Magic in Altdorf. Without being able to simply occupy these areas and move on, you will find yourself presented with a more focussed and varied set of gameplay choices. 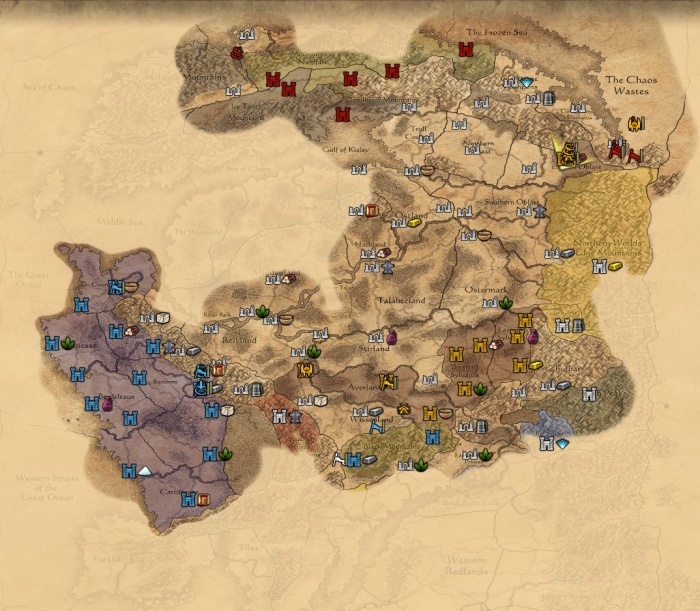 Lastly, here’s a shot of the current Campaign map with regions coloured according to which races and factions can own them as follows: The black and green shaded areas in the north are Norsca, the blue indicates the mountains and Badlands with Holds that Greenskins and Dwarfs can own, and the white areas are regions that all the other races and factions find hospitable. So as a Greenskin player, for example, you can see that you have a number of routes out of the Badlands depending on how you want to play. And if you did want to grow your strength through raiding even the most distant lands, there’s somewhere you can build a strike base in within a few turns’ march. Not to mention the Greenskin’s skills you could develop in bolstering their ability to operate and thrive in enemy territory. In summary, the fact that some of the occupation options are not the same as previous Total War games creates a new dynamic that both enhances the flavour of each of the races in accordance with WH lore and actually creates a more interesting sandbox game. The changes do make sense when you play, and don’t feel restrictive or annoying. There are still a ton of regions to occupy regardless of which race you play and the feel of the campaign game is even more different between the races as a result. Believe me, none of these decisions were taken lightly. We are all TW fans and feel very, very strongly about our games. Warhammer is still very much a TW game, but we looked to freshen things up and adapt around the WH lore wherever we feel it improves the overall game as a result. Internal feedback has been extremely positive so far and we’re confident you’ll feel that the region occupation system makes sense when you actually get to play the game. And finally, I’d like to add that that we were not just aiming to put a Warhammer hat on Total War. We had the opportunity to make something challenging, new and different from what you’ve played before, all while still having that crucial TW feel.